This unusual image by Chris Newsome highlights the brilliance of Mars against the background stars of Aries as seen in November 2005. 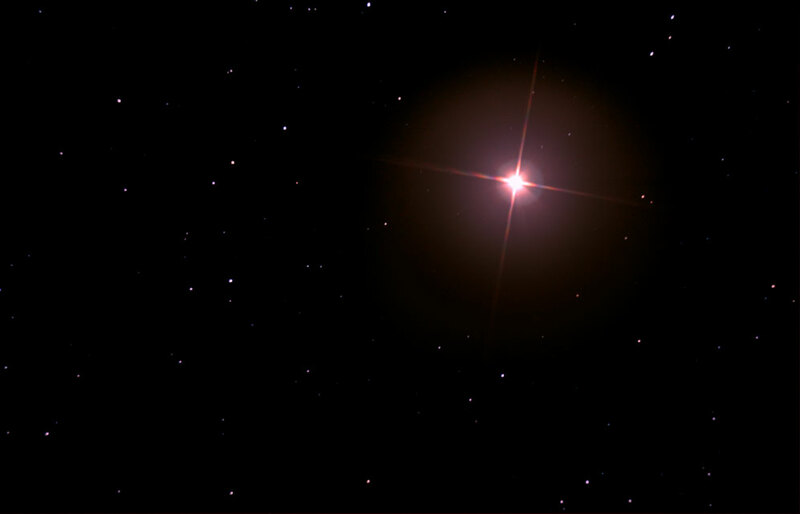 At the time Mars was unmistakable in the night sky due to it's redness and brightness (magnitude -2.0 to -2.3). The image was captured on 25th November 2005 using a Canon EOS 300D at the prime focus of a Celestron C6-N. It is comprised of ten 30 second images stacked in K3CCDTools and then dark subtracted with 15 dark frames. The final TIFF image was processed in CS2 using GradientXTerminator, curves and RGB levels. The area around the planet was not touched in the processing and as a result you see it how the camera recorded it. Chris only processed around the edges of the image to bring out some of the fainter stars and then matched the background to the background of the unprocessed area. 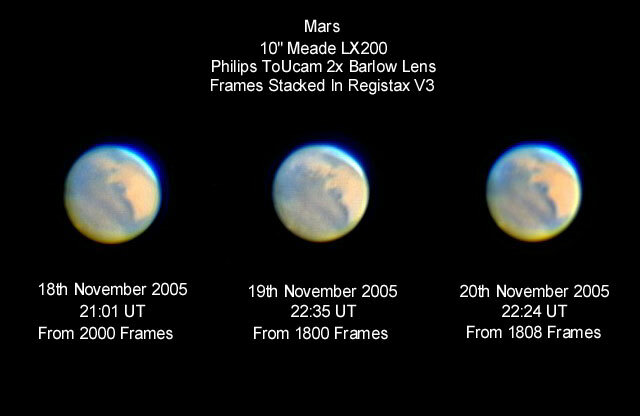 This spectacular sequence of images by Barry Ashforth shows the changing appearance of Mars between November and December 2005. 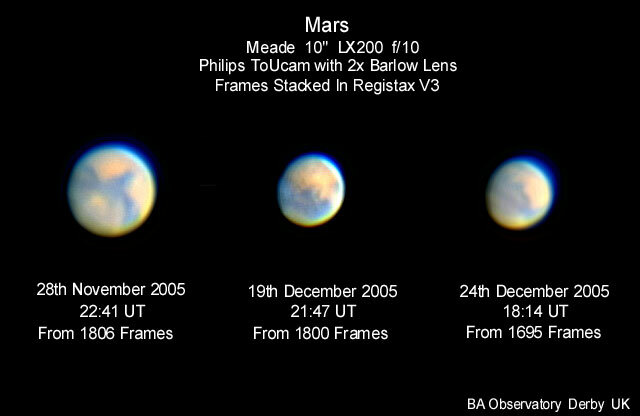 Simon Allcock took the following two images of Mars on the 18th November 2005. The one on the left was taken around 21:55 UT and is comprised of the best 361 frames out of a total 1584. The image on the right was taken around 22:44 UT and is the best 108 frames out of a total 714. Both images were stacked in K3CCD Tools and processed in Photoshop v9, and were taken with a Meade LPI and LX90. The rotation of the planet is evident when comparing the frames. 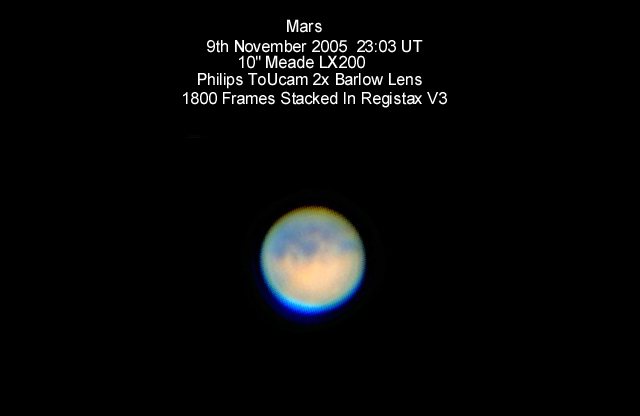 Barry Ashforth took the following image of Mars on the 9th November 2005. Syrtis Major lies in the middle of disk, slightly above centre. 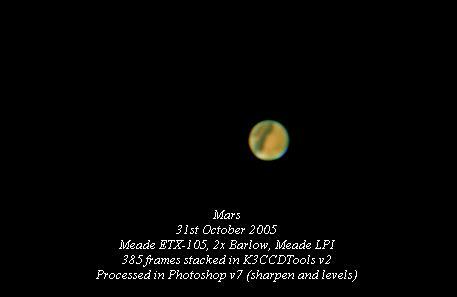 Barry Ashforth took the following image of Mars on the 6th November 2005. The prominent dark region extending into the disk from the two o'clock position is Mare Sirenum, and part of Mare Erythraeum is visible at a similar latitude on the left of the disk. The bright spot in the lower part of the disk might possibly be cloud capping Olympus Mons. Simon Allcock took the following two images of Mars on the 4th November 2005 using a Meade LX90 and LPI camera. The one at left was taken around 22.30 UT and is a composite of 900 frames. The one at right was taken around 23:25 UT using a 2x Barlow lens and is a composite of 510 frames. Both images were stacked in K3CCDTools and processed in Photoshop v9. Simon thanks Chris Newsome for his help with the LPI on the night, and Adrian Brown for his guidance and patience whilst processing the images! 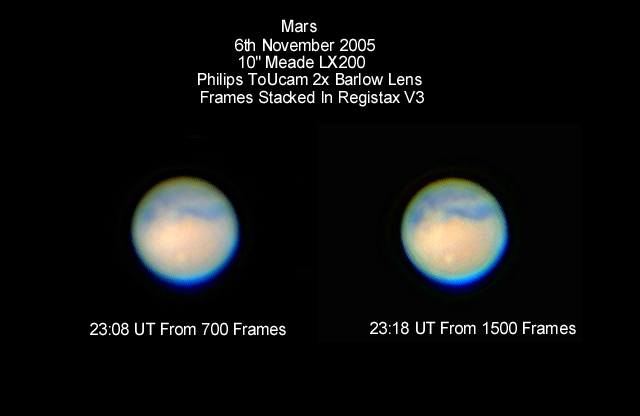 The following two images of Mars were taken by Chris Newsome on the 4th November 2005 using a Meade LPI camera and Adrian Brown's Celestron C11-SCT. The one on the left is a composite of 371 frames, while the one on the right is a composite of 368 frames and used a 2x Barlow lens. Both images were stacked in K3CCDTools and processed in Photoshop v9 using RGB Levels and an unsharp mask. The one on the right also employed a Gaussian blur. 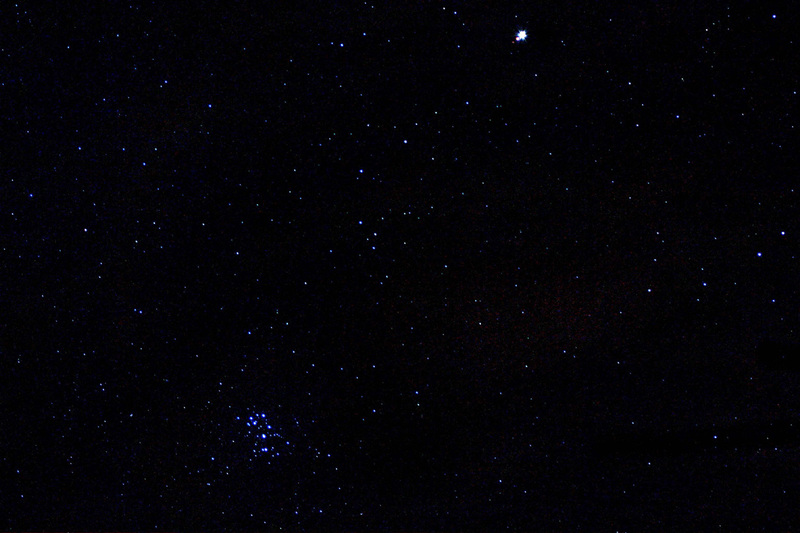 Chris Newsome took the following picture of Mars (top right) and The Plieades (lower centre) on the 1st November 2005. He used a Canon EOS300D camera piggybacked on a driven Celestron C6-N, with a 55 mm lens at 1600 ASA and a Skyglow filter. The image is composed of a stack of 3x30sec exposures in RAW format and converted to 16-bit TIFF. Stack and dark subtraction was done in K3CCDTools V2 and then the image was processed in CS2 (curves, RGB Levels and GradientXTerminator). Chris comments that the focusing was done manually as he didn't have his USB cable at the time to connect the camera to his laptop and utilise DSLRFocus software. 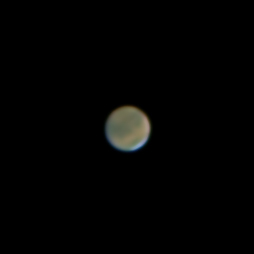 The following image of Mars was shot by Chris Newsome two days after closest approach on the 31st October 2005. 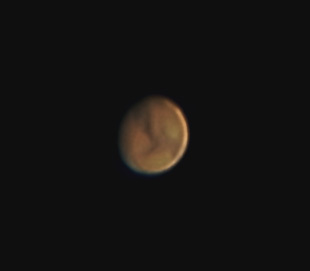 Adrian Brown also produced an image of Mars on the 31st October 2005. Adrian's image was taken around 00:39 UT and is a stack of the best 22 frames taken through an ATK-1C camera and an IR cut filter through Adrian's 11-inch Celestron CGE SCT. Adrian comments that the seeing conditions could only be described as poor and it was impossible to focus the camera with the 2x barlow lens so he had to stick with the C11 SCT at it's native f/10 focal ratio. Much of the upper central part of the disk is occupied by the drak band of Mare Cimmerium. 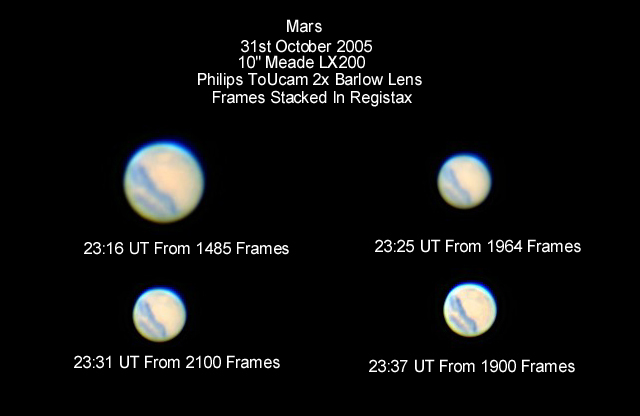 Barry Ashforth took the following images of Mars on the 31st October 2005. 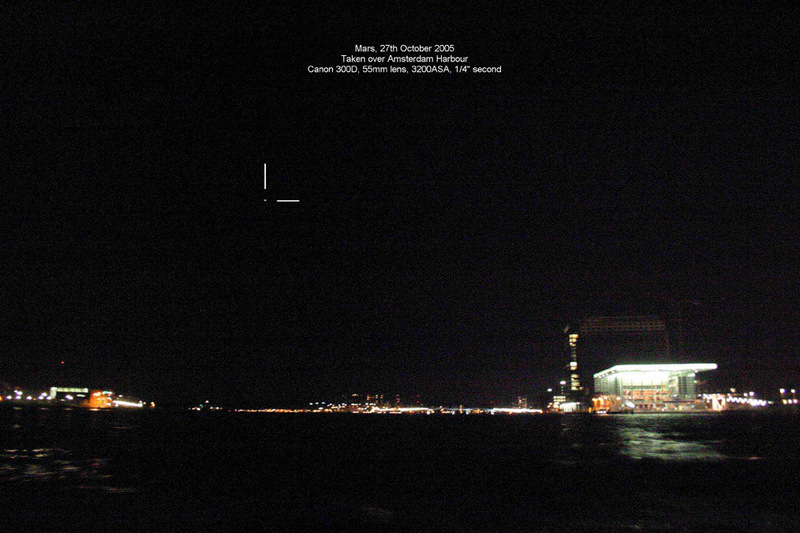 Mars rises over the lights of Amsterdam Harbour in this photo taken by Chris Newsome on the 27th October 2005. Chris used a Canon 300D digital camera with a 55mm lens, 3200ASA and 1/4 second exposure. 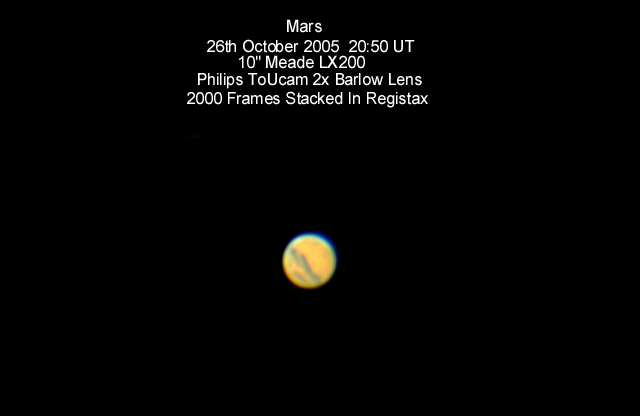 Barry Ashforth took the following image of Mars on the 26th October 2005. 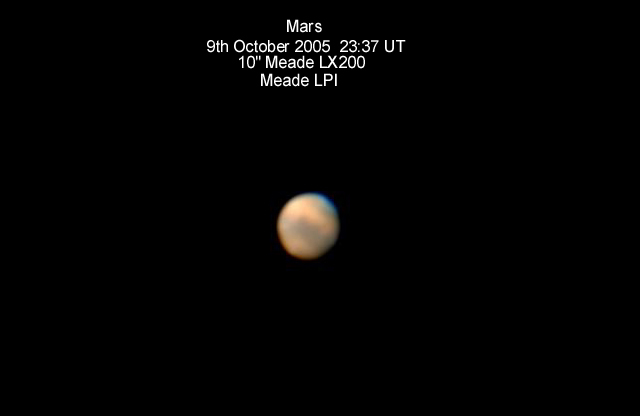 Chris Newsome captured the following picture of Mars on the 22nd October 2005 around 23:03 BST. He used a Meade ETX-105 with a Meade LPI camera and 2x Barlow. The images were stacked in K3CCDTools and processed in Photoshop v7. Syrtis Major is visible as the dark triangular area on the lower left portion of the disk, with the bright area of the Hellas Basin above it in the 9 o'clock position. Mare Tyrrhenum and Mare Cimmerium extend across the disk from Syrtis Major towards the 1 o'clock position. Mars imaged by Simon Allcock, Chris Newsome and Adrian Brown around 22:00 BST on the 15th October 2005 from Bretby. The team used Simon's Meade LX90 and Meade LPI camera, but seeing were too poor to allow use of a Barlow Lens. 900 images were stacked in K3CCD Tools with technical assistance from Chris and Adrian. The final image was processed in Photoshop v7 by Simon. 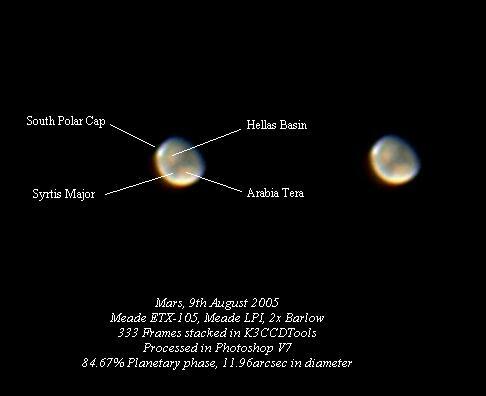 Barry Ashforth took the following image of Mars on the 9th October 2005. Mars imaged by Adrian Brown at 02:28 BST on the 17th September 2005. He used a Celestron C11 at F10 with an ATK-1C camera. The image is a stack of the best 20 frames out of 3229 using K3-CCD Tools. Further processing was done in Photoshop. Adrian comments: "My unprocessed stacked image was very red and the markings on the surface were quite faint. I found that using the 'Hue and Saturation' tool in Photoshop to reduce the saturation level helped to darken the surface markings and make them stand out more, at the expense of making the south polar cap less obvious". 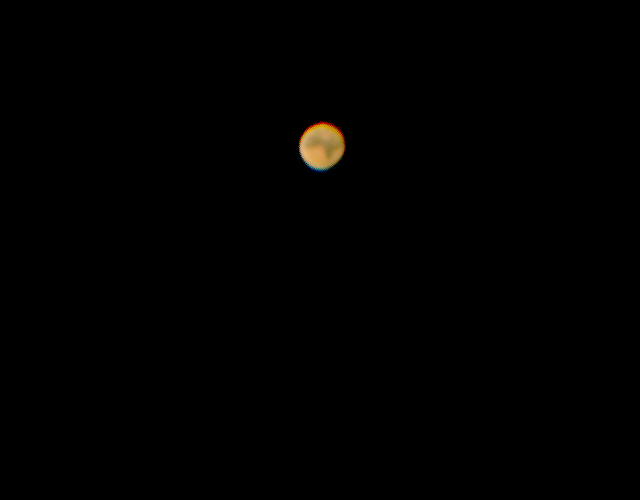 Mike Lancaster captured the following image of Mars in the early hours of the 17th September 2005 from Derby using the Society's 8" Meade LX-90, an LPI camera and a 2x Barlow. Mike manually selected the best 30 frames from a sequence of 800 taken with the LPI camera and stacked them in K3CCD Tools. An unsharp mask was then applied using Adobe Photo Deluxe. 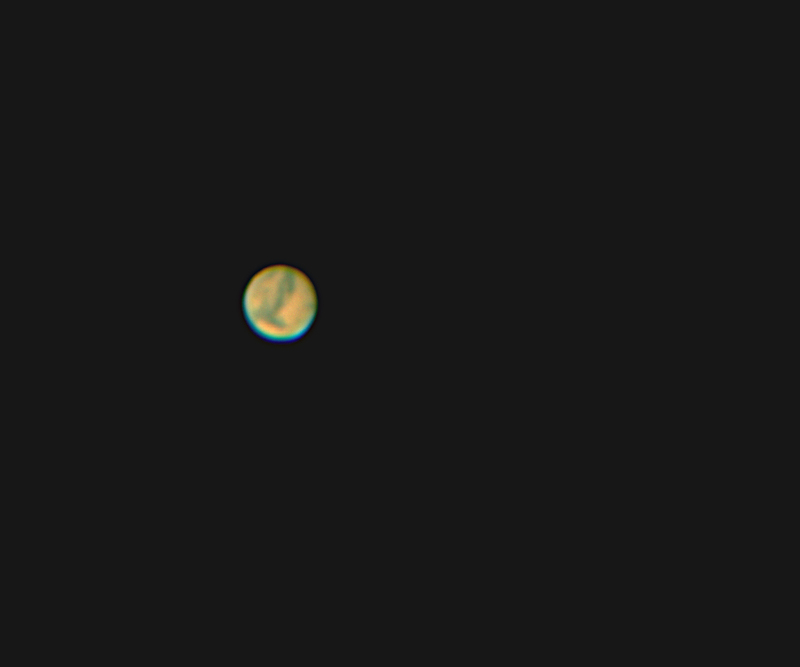 This is Mike's first attempt at planetary imaging. 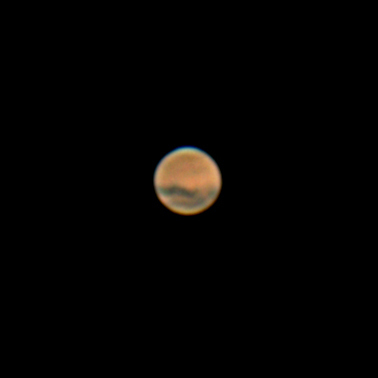 Mars on the 9th August 2005 by Chris Newsome.